Above: Cover of “Not in My Neighborhood,” by Antero Pietila. In his new book, former Baltimore Sun reporter Antero Pietila has flung open the door on Baltimore’s past as a leader in residential segregation. How did we get to the world of “The Wire?” Think of “Not in My Neighborhood: How Bigotry Shaped a Great American City” as a spellbinding, non-fiction prequel to the HBO series. Pietila clearly has a big national story to tell. The book shows how discrimination toward African Americans and Jews shaped today’s cities, how eugenics and white supremacist thinking drove the federal government’s housing policies and how redlining and blockbusting evolved into the corrosive subprime mortgage craze we just experienced. But when Baltimoreans open this much-anticipated book — and read new details about racial and religious covenants and admissions quotas and real estate practices in their hometown — they’ll feel a special sting because the story’s central characters – famous families and prominent institutions — are still right here. Released this month, “Not in My Neighborhood” is the product of ten years of research and interviews with key players in the Baltimore real estate market. Pietila dug through city records, haunted the Maryland Room of the Enoch Pratt Central Library, and parlayed contacts from his Sun days into interviews with aging real estate brokers involved in the lucrative business of segregating Baltimore’s neighborhoods. The book exposes the clandestine dealings that rendered the city physically, economically and politically divided – ghettoization that has only deepened over time. While the broad outlines of this story are known, Pietila has connected prominent local figures to the city’s legacy of segregation and filled holes in the narrative, revealing that very little about the process was random. Using an unprecedented amount of primary source documents obtained from the Baltimore Jewish Council, Pietila finds anti-Semitic residential practices — and names — that raise eyebrows. Noted Jewish builder and philanthropist Joseph Meyerhoff, for instance, refused to rent or sell to fellow Jews in the area of Roland Park, which he had developed in partnership with the Roland Park Company. Pietila writes. Meyerhoff was eventually confronted by the Baltimore Jewish Council in 1948 in a formal letter beseeching him to show solidarity with the Jewish community, but he claimed he’d be ruined if he opened his developments to Jews in a city where most of his customers weren’t. The recovered correspondence described in Pietila’s book is clear – Jews resisting housing bias had no ally in Joseph Meyerhoff. Other prominent names appear in unexpected places. In 1951, James W. Rouse, as co-manager with another mortgage banker of the Marylander Apartment building in north Baltimore, defended the establishment of a 12 percent quota on Jews until the building was 75 percent rented. Built on a parcel owned by the Roland Park Company, the Marylander was one of many apartments at the time in the city that either restricted or completely excluded Jews. Rouse would later be hailed as a pioneering real estate developer who championed integrated “new town” communities. Pressed by the Jewish Council, the school agreed in 1951 to stop asking JHU applicants their religious affiliation, but in return the Council agreed “to try to disperse the Jewish pre-med applications” to other institutions. Likewise, the University of Maryland Medical School capped Jewish applications at 14 percent in 1936, Pietila writes, and limited the number of local applicants to further discourage Jews. They finally eliminated the question of religion from applications in 1950. There have long been rumors and whispers about these quotas, but here Pietila has documented them as fact. “Not in My Neighborhood” breaks down the practice of “redlining” – denying access to housing and financial services to residents in racially determined areas. Pietila explains how banks used maps that were quietly drafted by the federal government to determine which neighborhoods to grant financing, and which to leave open to exploitive speculators. 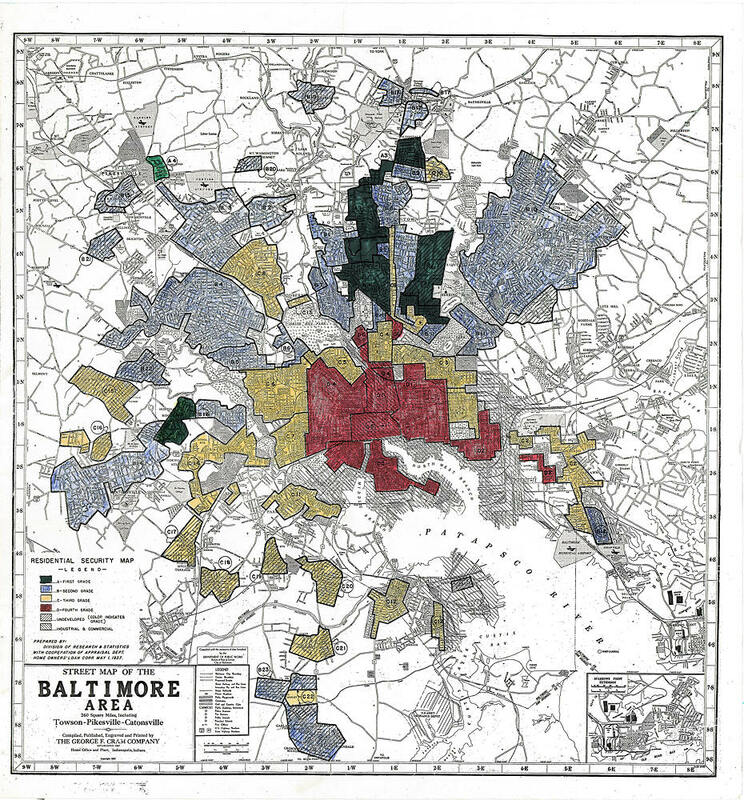 1937 federal government map of Baltimore redlined African American and Jewish center city. Homes there could only be bought through speculators. CLICK TO ENLARGE. “Red, the universal color of alarm, smeared neighborhoods deemed to be ‘hazardous’ and dangerous’” because of their African American residents, Pietila writes. The intermediate racial groups were left to fight for middle ground, and if white, were set upon by blockbusters looking to make a quick buck off of racial distrust. Among these speculators, none emerge in as polarizing relief as Morris Goldseker, whom Pietila profiles with sweeping new detail. Goldseker (or “Goldsucker,” as some under his stewardship called him) is depicted by Pietila as perhaps the most high-profile of the profiteers who acquired houses at low cost from panicked whites and sold them at strict terms and inflated prices to blacks. Pietila relates an anecdote that took place during a suit filed against Goldseker. Upon learning that her house contract was with Goldseker, a widowed mother of six told the court that she had broken down into tears. Such was the power of his reputation. The book reveals that much of the housing that blockbusters were turning over was of poor quality. After the war, cities began enforcing housing and health codes, and new black homeowners were unprepared for the ensuing costs. These are the roots of ghettoization in Baltimore. Though the scare tactics of blockbusters are well known, “Not in My Neighborhood” goes further, documenting the reaction of media, politicians, and activists and taking readers into Baltimore’s psyche, as its racial makeup churned. One especially vivid chapter, for instance, focuses on Fulton Avenue, which became a racial demarcation line with whites on one side and blacks on the other. The crossing of that line during the Christmas holidays in 1944 set off a chain reaction of panic, anti-black and anti-Jewish hostility and block busting that was a real tipping point for the city. No ethnic group or profession emerges with its hands entirely clean in the creation of a racially divided city. Warren S. Shaw, a man Pietila describes as “a born hustler,” was an African American who came to Baltimore as a bus driver after city transit desegregated in 1953. He formed probably the first major business partnership with a white man, Manuel Bernstein. The trend of exploitation evolved and endured. “Not in My Neighborhood” draws a parallel between the overt race-baiting of blockbusting and its more insidious modern descendants, the practices of real estate flipping and sub-prime lending. The scope of Pietila’s research over the past 130 years is dazzling. Each paragraph of “Not in My Neighborhood” is girded by multiple footnotes that point to committee meeting minutes, notes from conversations with long-dead participants, and Pietila’s own interviews, among countless other sources. He believes the work he has done to uncover the back-story of Baltimore’s residential segregation is unmatched by scholars in other cities. 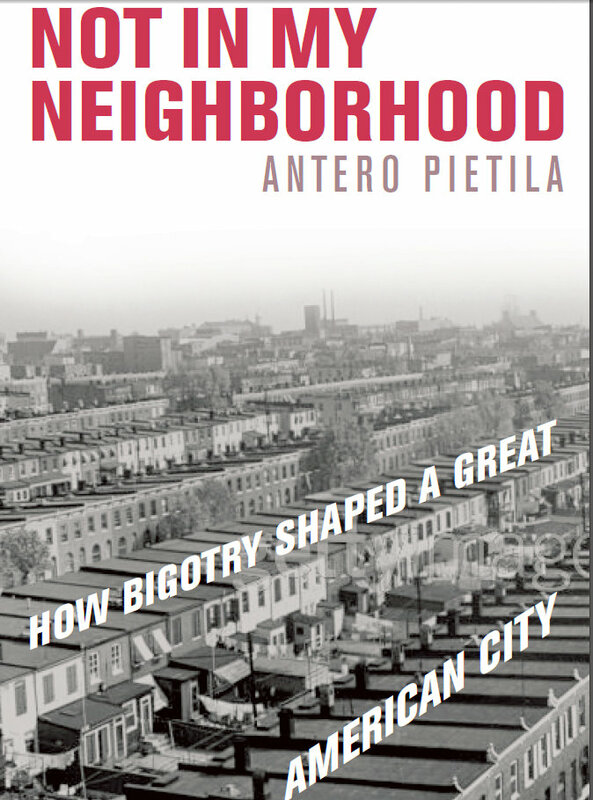 Antero Pietila’s “”Not in My Neighborhood: How Bigotry Shaped a Great American City” published by Ivan R. Dee, is available now at local bookstores, and through amazon.com and barnesandnoble.com. WYPR’s Dan Rodricks will have Pietila on the air to talk about the book on March 1.